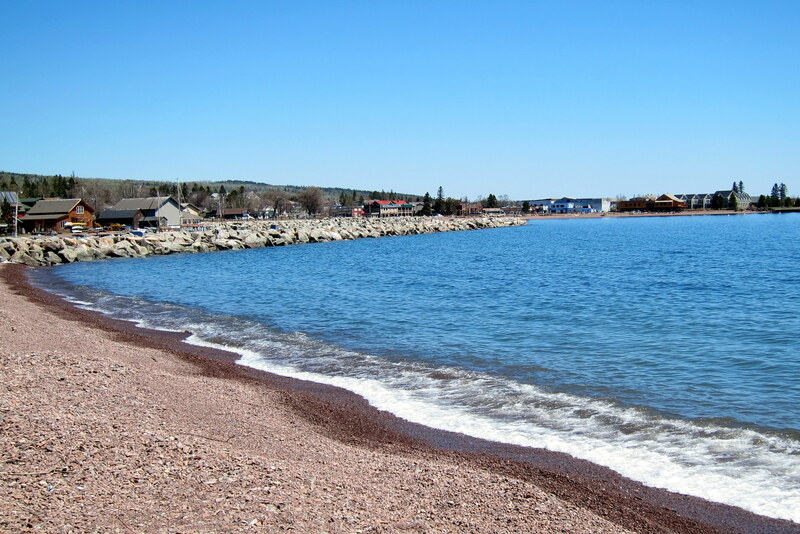 Monday, May 16, 2011-Grand Marais, Minnesota: What a great town! We decided to spend an additional night here to really get a sampling of all this area has to offer. 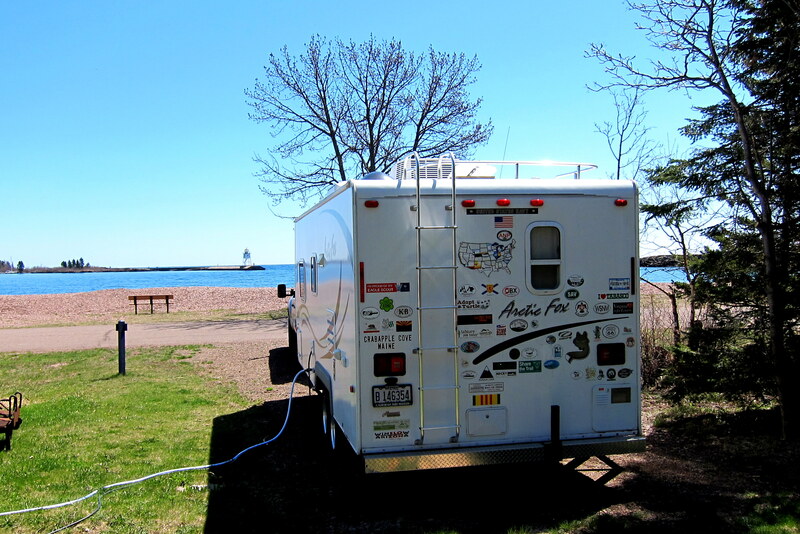 To begin with we set up in a very nice municipal campground right on Grand Marais Bay. 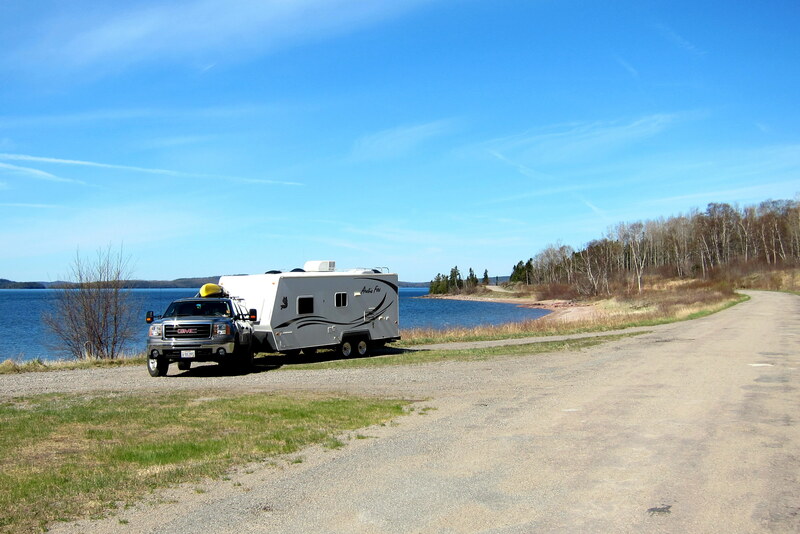 Kit and I have encountered more and more coastal Lake Superior towns that have taken a portion of their municipal property and created campgrounds for travellers, tourists and locals alike. 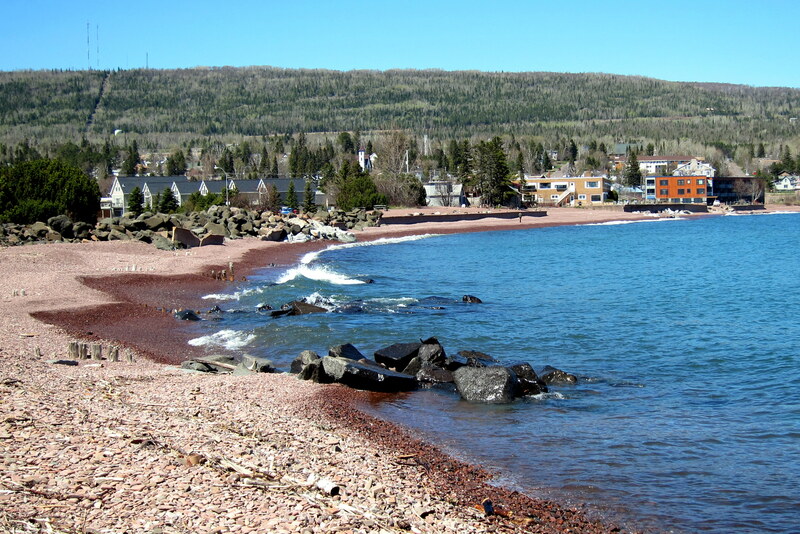 The Grand Marais Campground features a nice in town RV Park located on the public beach and right next to the town marina. The neat thing about these facilities is that the local citizenry continues to have access to the waterfront. 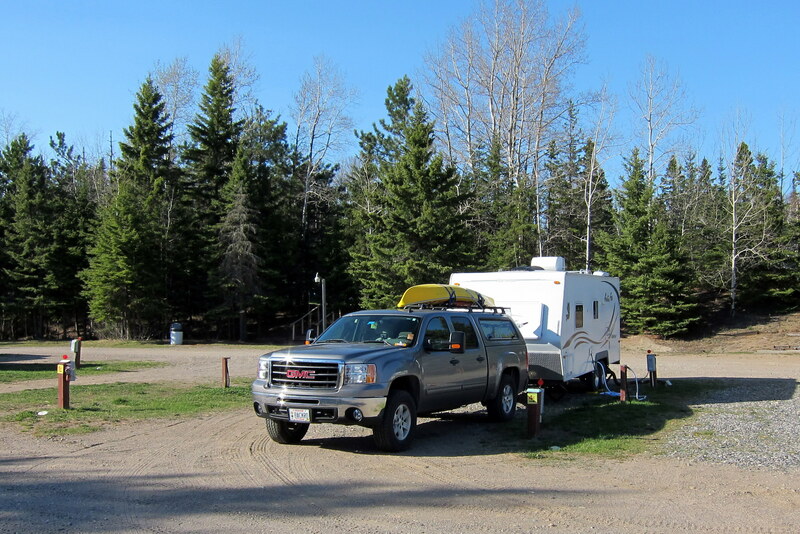 They enjoy all the campground amenities along with the camping visitors who pay into the towns coffers. Sounds like a win-win to us. 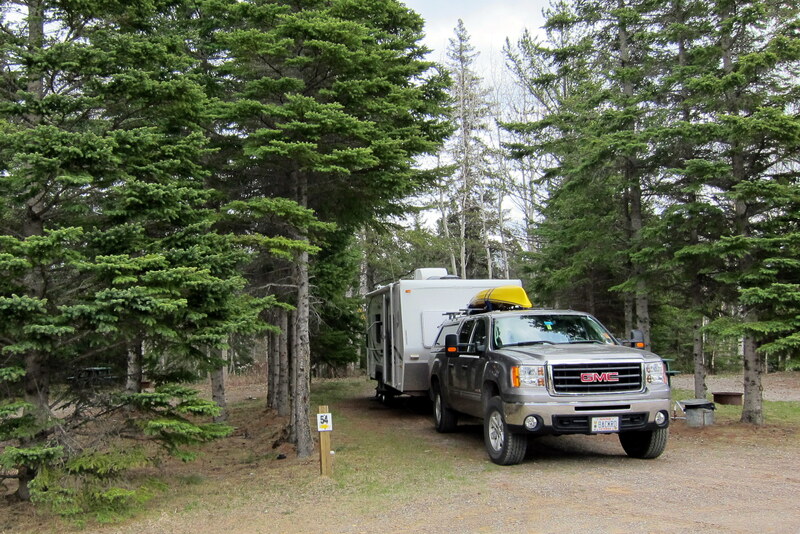 There are a few park model type trailers in the campground and other sites that appear to indicate seasonal use. In talking to the manager we discovered that about half their summer population normally resides in southern states and camp here to escape the heat and humidity of the south. 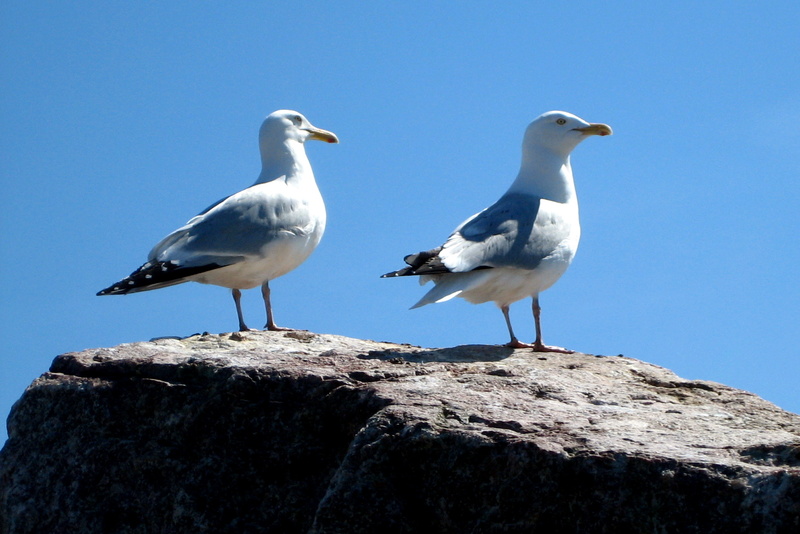 Kinda like reverse Snowbirds…..or Hotandhumid Birds. As an added bonus this campground is within walking distance of the town center which contains many unique gift shops, bait suppliers, restaurants and outdoor outfitters. 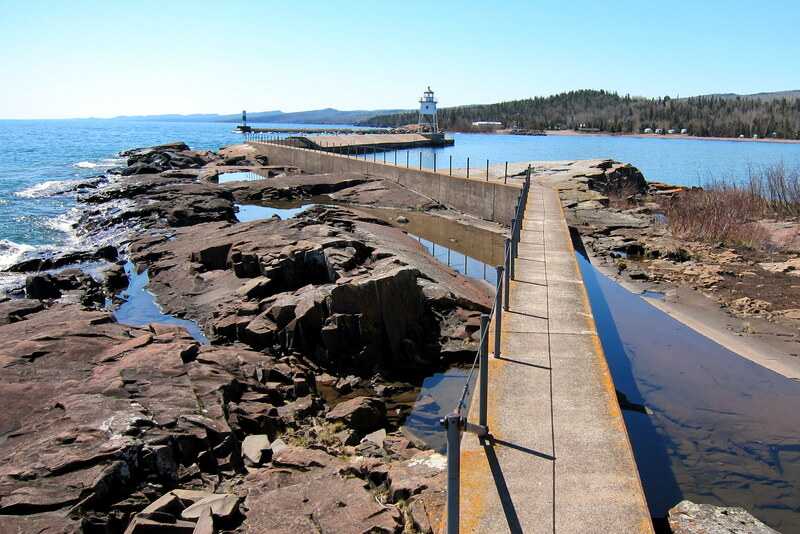 While Kit shopped in the gift joints I took a walk out to Grand Marais Point and along the breakwater that protects Grand Marais form the “Gales of November”. 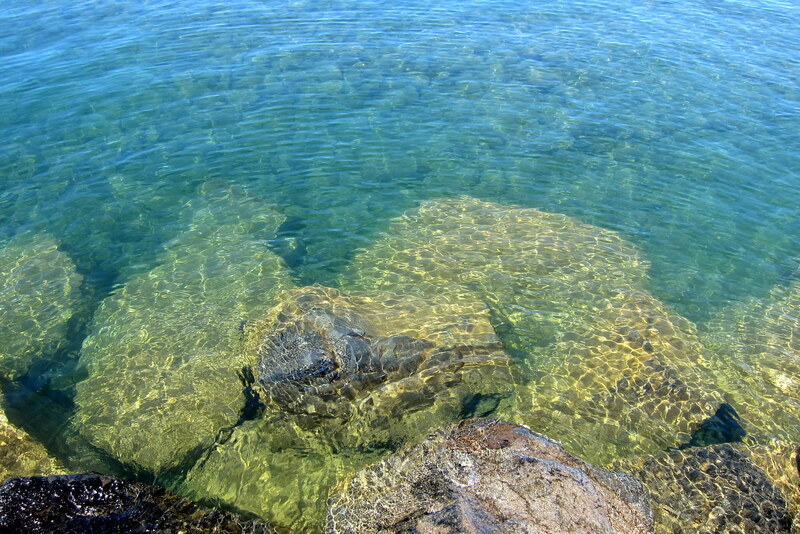 The cold water is crystal clear; I was able to peer down to the bottom some 15 feet or so. 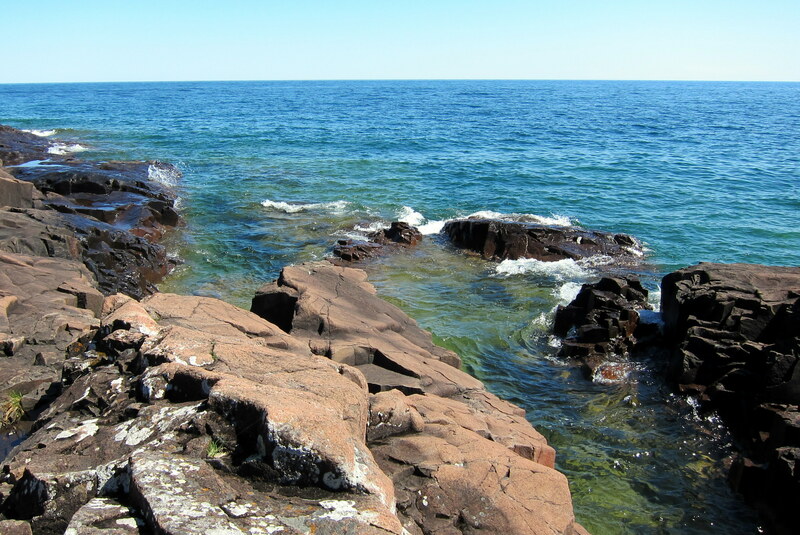 The information on water quality of Lake Superior claims that this 31,000 square mile fresh water pool has up to 60 feet of underwater visibility. The water is so pure that some locals consume it directly from the lake. 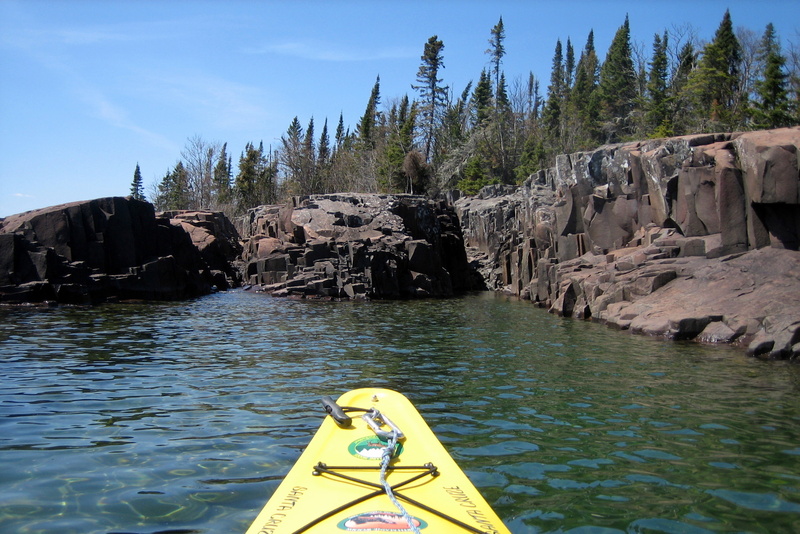 Lake Superior is the largest freshwater lake in the world and combined with its Great Lakes neighbors contains one fifth of the world’s fresh water. These massive lakes are large enough to have an Oceanic Climate effect on its coastal communities keeping them warmer in the winter and cooler in the summer than town’s further inland. The shoreline continues to resemble our home state of Maine, with rugged landscapes that merge with the cobalt blue water. However the thing that strikes us time after time is how this Maine looking scenery lacks the fragrance of the Maine salt air. After meeting Kit for lunch I walk back to the campground. 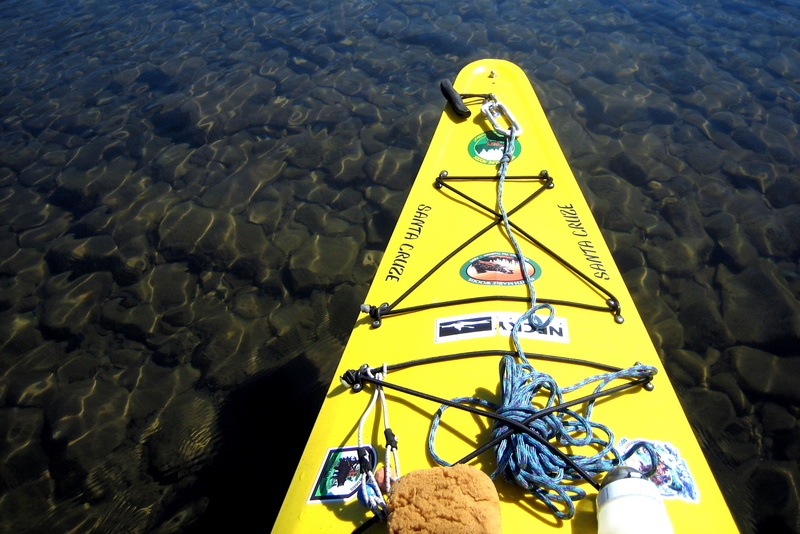 I’m anxious to get on the water as I want to use the outgoing tide to assist my paddle out of the bay. Unloading the kayak I carrying it down the beach and put in for a nice relaxing three hour paddle. It was a beautiful sunny afternoon to be on the lake. Making my way out to the breakwater I enjoyed a unique view of the village and the light station that guides mariners in and out of Grand Marais Harbor. Beyond the breakwater the glassy smooth lake looked like an ocean. 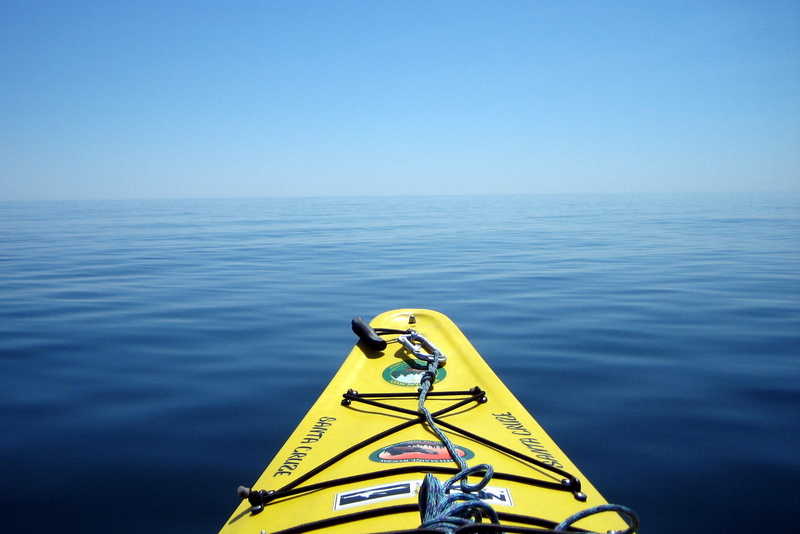 If I kept paddling in this direction I would eventually hit Silver City, Michigan some forty miles away. Deciding that would be a little long for an afternoon’s paddle and that the lake probably won’t stay this calm and that Kit is expecting me back in time to cook dinner, I turned around and started to explore the rugged shoreline. 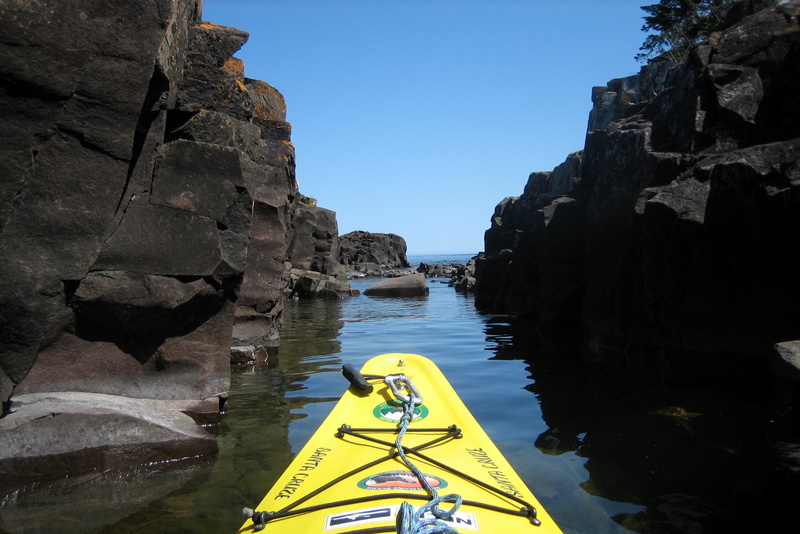 There are many places where you can paddle into narrow channels until you actually start hitting your paddle blades on the opposing walls. Below is another example of just how incredibly clear this lake’s water is. The sun making shadows on the lake bottom created an unusual visual experience. One I had not experienced since the 1960’s. It might be nice and sunny but this water is cold…..about 40 degrees on average. Because of this I was wearing a “spray skirt” which kept me pretty dry. However the paddle drips made my hands wet and therefore very cold. After a few hours paddling I decided to ride the incoming tide back to shore. Back at camp Kit hadn’t yet returned so I decided to use the wide beach and consistent breeze to fly my kites for a few hours. After Kit returned to the camper laden down with her newly purchased treasures we fixed a couple of cocktails and sat down to admire this incredibly beautiful place. With two of our closest neighbors intently watching the snacks we were consuming. Oh, by the way…..you’re right…..there is no true tidal effect on a lake! You didn’t fall for that, did you? 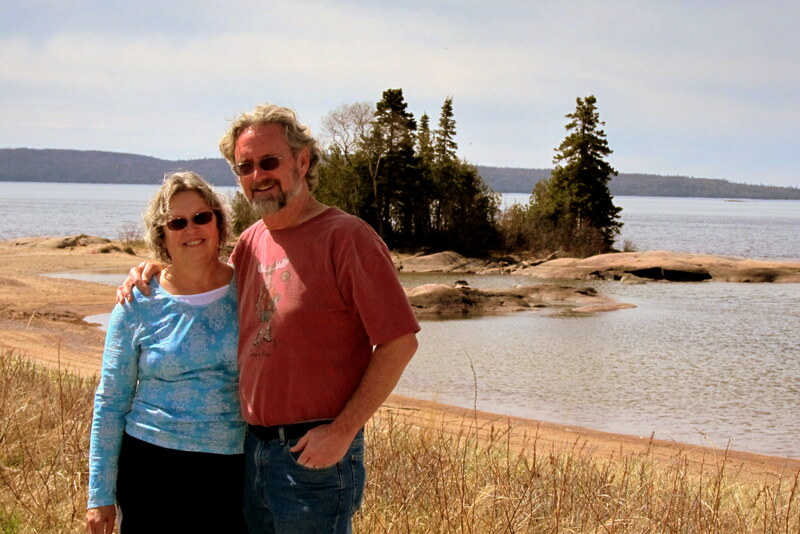 Tuesday, May 17, 2011: Up early and after a nice breakfast, which included Snicker Doodle Coffee purchased from the local Boundary Waters Coffee Company, we enjoyed a stroll along the beach. Reluctantly leaving Grand Marais we moved back on MN-61 and continued our way northeast. Soon we came to Grand Portage, the last town in Minnesota before arriving in Canada. Stopping to see if we could pick up an English to Canadian translation book we noticed the Grand Portage National Monument Visitors Center. 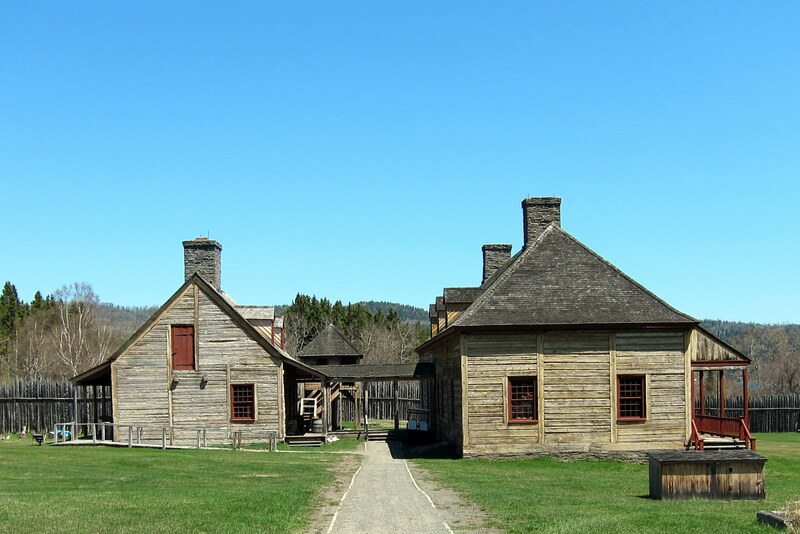 Grand Portage was a historically important location. 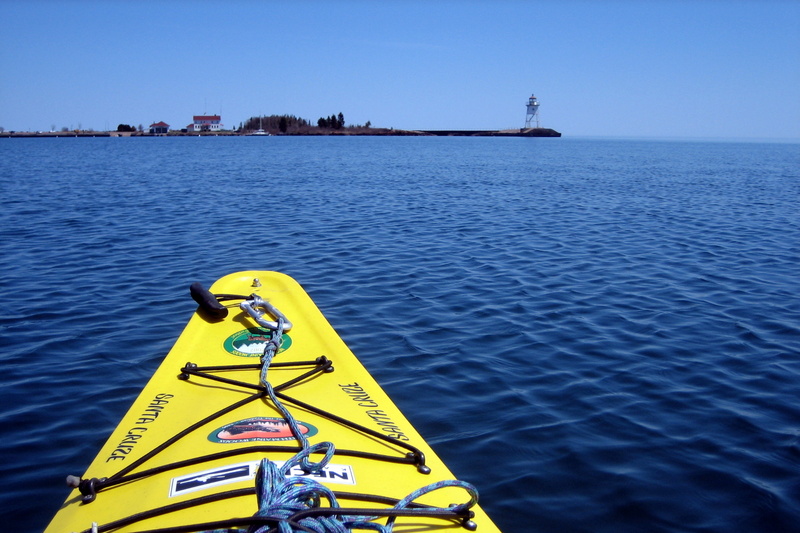 As the key fur trade port to Indian trapping grounds, Grand Portage was a rendezvous point for canoeing voyageurs to meet their inland counterparts. As the working class of the fur trade the primarily French-Canadian voyageurs paddled 36 foot canoes from Montreal to Grand Portage. There the loads of store bought tools, blankets, tobacco and liquor were transferred to the northern voyageurs. 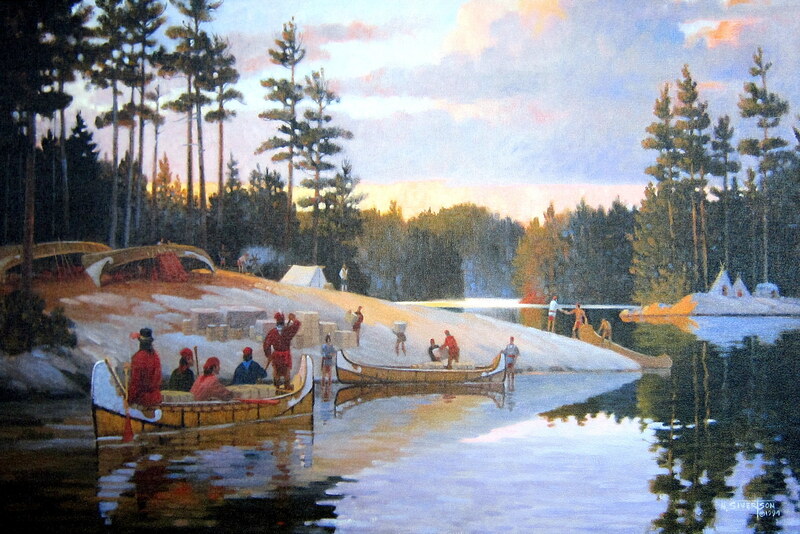 They in turn would portage the goods inland eight and a half miles to the Pigeon River where they paddled smaller canoes northwest to live and trade amongst the Indians. The North West Company, unlike the better known Hudson Bay Company, actually went into the northern territories to seek out the Chippewa Indians to trade with. This strategy worked well as by the year 1800 the Grand Portage was a virtual highway of thousands of men carrying multi 90 pound bundles of trade goods. After the trading was complete the furs and pelts, mainly beaver, would be hauled back to Grand Portage and once again loaded on the larger canoes for the trip back to Montreal and shipment to points throughout the world. This trade kept going to fill the insatiable desire for quality Beaver Felt for fashionable, and waterproof, clothing. As the beaver population diminished the Indian trappers and their associated voyageurs would push further north. 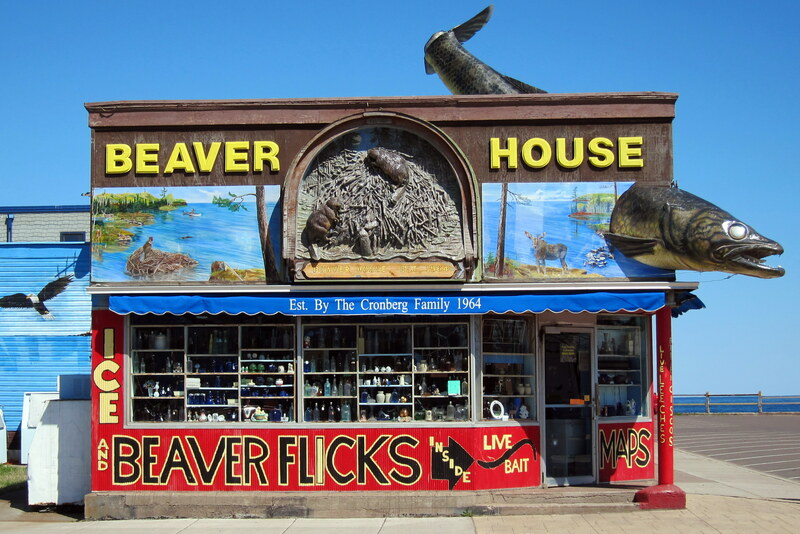 Soon the animal became quite scarce and the trafficking in beaver pelts diminished. 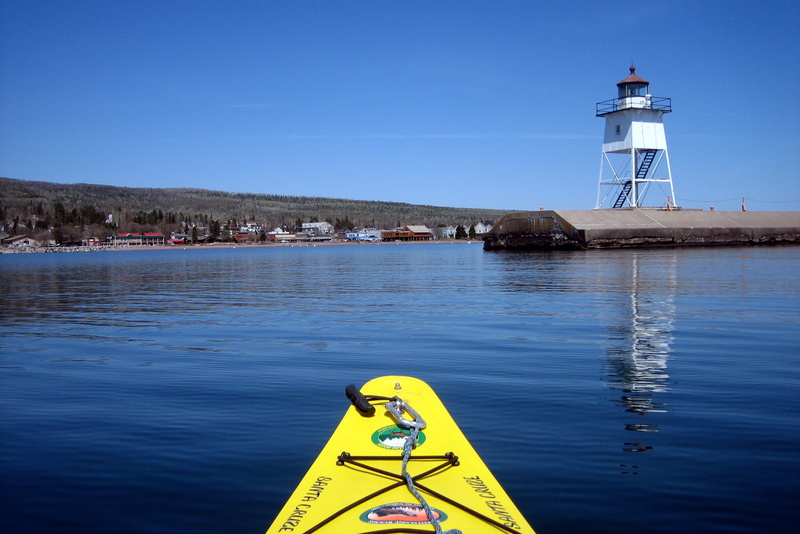 Grand Portage then became just another small village on the shore of Lake Superior. Back on highway 61 we crossed the Canadian border into the province of Ontario at 1400. 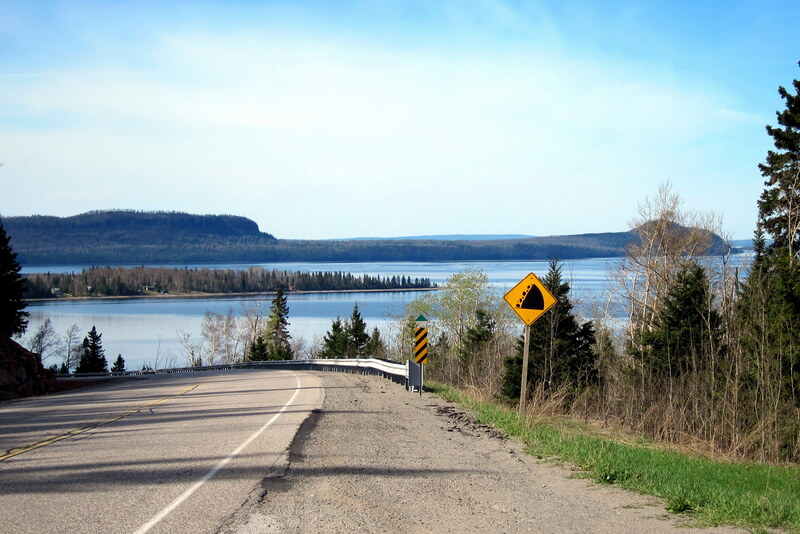 There we connected with Highway 17, The Trans Canadian Highway, through Thunder Bay and to points northeast. 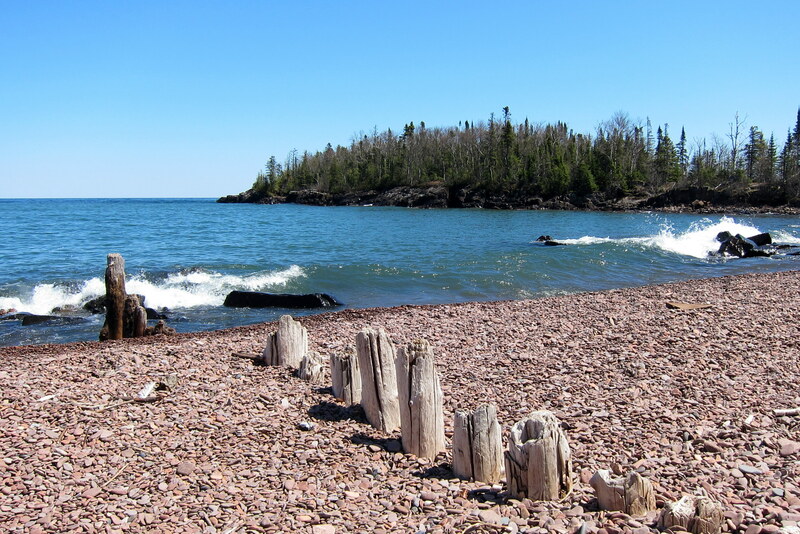 As in Minnesota, the coastal highway affords many places to stop and enjoy the views. This particular spot was just west of Marathon, Ontario. 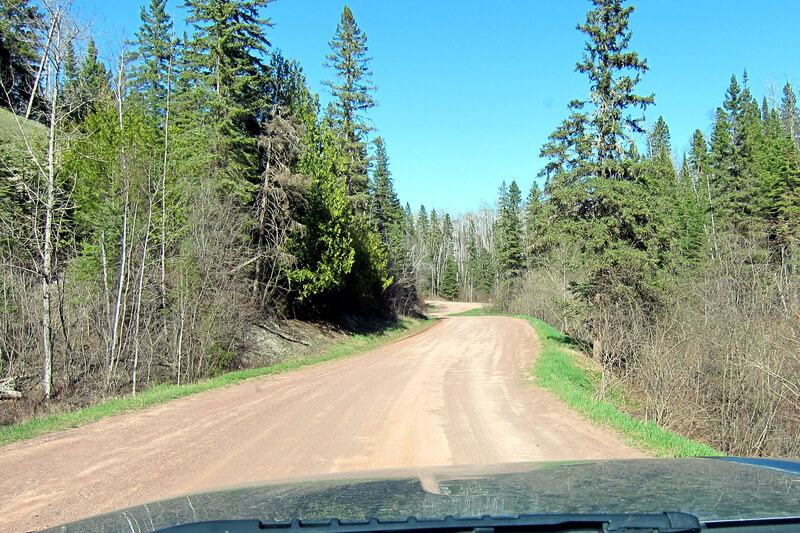 Also in driving along we noticed a number of intriguing parallel roads so we decided to explore. Most were dirt but very well maintained. Rounding a bend we came upon this little fella playing in the road. He waddled into the roadside underbrush as we crept closer. Not sure where mom or dad were but decided to move along. In the small town of Nipigon we stopped for the night at the Stillwater RV Park, a nice family run campground run by a young couple from British Columbia. We chose a site and settled in for the night. Wednesday, May 18, 2011: Up and on the road by 0950 under sunny skies and temperatures in the 60’s. Back on CN-17 we trundled forward toward the east. Highway 17 is primarily a two lane road with passing lanes provided every 15 miles or so. The speed limit is 90 KPH which affords us the luxury to move along at our preferred speed of 55 MPH without inconveniencing anyone too much. Near the town of Scribner we pulled off the highway onto a secondary road and came to this nice spot for a break. I took the opportunity of the nice background to use the camera’s self-timing feature and snap a photo of Kit and me. After a few more hours driving and a nice snooze (by Kit) we entered the mining town of Wawa and pulled into the Wawa Campground. Once again we were able to have our choice of sites. After a nice meal and a walk in the woods surrounding the campground we turned in for the night. Tomorrow we explore the town of Wawa…..and finally discover what a Wawa actually is! Stay tuned. BTW, that sounds like a great town and I love the campsite!. You always enterain with the journals. You could have been a second Mark Twain!!!! WOW…..that’s quite a humbling thought, and so very nice of you to say. Thanks! Thanks for the kind comment. We started chronicling our travels to primarily let our kids and grand kids know what we were up to. However it appears that a lot of our friends enjoy reading them as well. Our website hit counter is over 10,000! Pretty humbling…..and surprising. 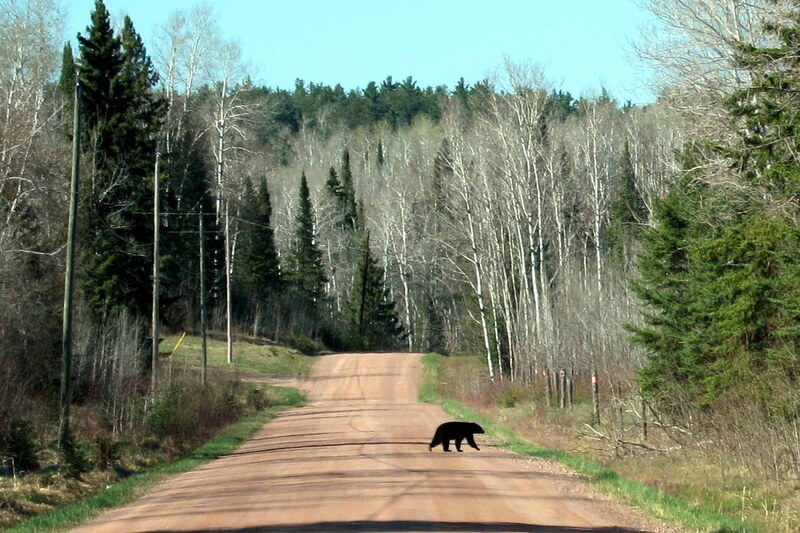 I am glad that you went through Duluth and Grand Marias when you did! Have you seen the recent news on Duluth? Lots of road closures due to floods. Even highway 35 was shut down for awhile.